We’d love your help. Let us know what’s wrong with this preview of Be Our Guest by Walt Disney Company. Reveals the behind-the-scenes strategies, principles, and processes of the Disney approach to exceptional customer service, which emphasizes the best ways to provide quality service to one's customers. Reprint. 25,000 first printing. To ask other readers questions about Be Our Guest, please sign up. I sometimes wonder if companies purposely write hypnotically boring business books to make readers lose interest in discovering the real trade secrets. Going into "Be Our Guest", I was hoping for juicy details about Disney's creepily scientific customer service (i.e. the way they subtly manipulate your emotional state with music and visual cues), but it read just like your typical business book. If you like bland execu-speak and forced acronyms that help you remember corporate values, then this I sometimes wonder if companies purposely write hypnotically boring business books to make readers lose interest in discovering the real trade secrets. Going into "Be Our Guest", I was hoping for juicy details about Disney's creepily scientific customer service (i.e. the way they subtly manipulate your emotional state with music and visual cues), but it read just like your typical business book. If you like bland execu-speak and forced acronyms that help you remember corporate values, then this book is for you! As a pastor and leader, I am always trying to think of what I can do to create an environment that will open up people's hearts to the most important truths in the world. If anyone understands how to create compelling environments, it's Disney. "Quality service means exceeding your guest's expectations and paying attention to detail." "My business is making peopl As a pastor and leader, I am always trying to think of what I can do to create an environment that will open up people's hearts to the most important truths in the world. If anyone understands how to create compelling environments, it's Disney. "We don't put people in Disney. We put Disney in people." Being a huge Disney fan, I really wanted to love this book. And the behind the scenes peek at things that one would normally not learn unless they were a Disney employee about the way they deliver an unparalleled experience was quite entertaining. However there wasn't enough practical application to make this a useful book for trying to evaluate my own corporate culture. Some exercises to apply the Disney philosophy to other industries would have made this more helpful. Simple things done to the asymptote defines what every business should strive for. Disney certainly does this better than any other. Largest single site employer in the U.S. Page 19 "Think for a moment about a magic show. To the audience, the show elicits feelings of wonder and surprise. Most of those watching have no idea how the magician is creating the effects they are witnessing on the stage. Not knowing how an illusion is created and simply enjoying the show are a big part of the fun. The magician's perspective is completely different. To the magician, a magic show is a highly practical task, a series of repeatable steps designed to create a fixed result and delight the audience. Partnerships – relate to 16 separate branches at MCLS ? … The challenge is to maintain Disney standards in restaurants and hotels the company does not own and to make passing between these separate businesses a seamless experience for guests. Customer Service Conundrum – Customer retention requires customer satisfaction, but customer satisfaction is a moving target. Consumers as a whole are more demanding than ever, and rightly so. Further, delighting the repeat guests on whom Walt Disney depends means raising the service bar with every visit. We all must satisfy our guests or customers or patrons or risk losing them. Make a clear distinction between being on and off stage. Employees are on stage every time they are in public areas of the park or in front of guests. Employees are backstage when they are working behind the scenes and out of guests sight and hearing. Since I am fascinated by all things Disney right now, I was wondering if I could gain any value from listening to this book. I work in a position that is essentially customer service so I hoped I could get a couple nuggets. This is a book marketed to companies who want to use Disney tactics to up their business and customer service. This book somewhat bamboozles the audience with the bait and switch. It’s tough to recreate Disney magic in a not-fun industry (like computer software or in my case, Since I am fascinated by all things Disney right now, I was wondering if I could gain any value from listening to this book. I work in a position that is essentially customer service so I hoped I could get a couple nuggets. This is a book marketed to companies who want to use Disney tactics to up their business and customer service. This book somewhat bamboozles the audience with the bait and switch. It’s tough to recreate Disney magic in a not-fun industry (like computer software or in my case, insurance) and a lot of Disney tactics are non-transferrable and not universal. What the book became for me was a peek behind the curtain at some of their techniques, mission statements, and processes. A lot of the book cannot be applied to my situation and the majority of businesses. Still, it was an informative read I'm glad I read even though dry at times. The "secret sauce" that Disney uses for customer service is actually pretty simple, and I'm sure there will be/are many reviews criticizing it for its simplicity, but that's the thing about business strategy - most effective strategies actually ARE very simple. The trick is finding managers who can execute them consistently and who can find and motivate employees to follow them. The book is a little light on implementation, but the reality is that every business/industry will have some pretty sp The "secret sauce" that Disney uses for customer service is actually pretty simple, and I'm sure there will be/are many reviews criticizing it for its simplicity, but that's the thing about business strategy - most effective strategies actually ARE very simple. The trick is finding managers who can execute them consistently and who can find and motivate employees to follow them. The book is a little light on implementation, but the reality is that every business/industry will have some pretty specific requirements, so there was no way they could offer much practical advice. A bit outdated but good tactics and understanding of customer service magic! As a former Cast Member who was also part of the Disney University, I really enjoyed this book. It’s a great introduction into how Disney is so successful and consistent. The Disney Institute has written a very interesting book describing Disney's approach to providing world class service to their "guests." In a clear and compelling style, Be Our Guest outlines principles of service quality that can be readily adapted to the needs of most organizations. The quality service cycle is introduced, with its focus on (a) a service theme, (b) service standards, (c) delivery systems, and (d) integration of them all into one coherent whole. They emphasize the importance o The Disney Institute has written a very interesting book describing Disney's approach to providing world class service to their "guests." In a clear and compelling style, Be Our Guest outlines principles of service quality that can be readily adapted to the needs of most organizations. The quality service cycle is introduced, with its focus on (a) a service theme, (b) service standards, (c) delivery systems, and (d) integration of them all into one coherent whole. They emphasize the importance of employees ("cast," in Disney-speak), setting, process, and integration in delivery of the service quality cycle. Each of these is treated in depth in succeeding chapters of the book. 1. The concept of combustion points, as early warning indicators of potential explosion points. 2. The absolute need to mix with customers and stakeholders…you learn little when you distance yourself from them. 9. The concept of the “Integration Matrix” as a way to guide the process of service quality analysis and improvement. 10. The concept of the storyboard as a tool for mapping out service solutions and their implementation. A great adaptation from the creative process first developed by Disney artists. I read this book as part of a "common reading" for a select group of staff and faculty at my university, with an eye toward applying the principles in our environment. I believe we are already doing good work with our students, student families, potential employers, and other stakeholders, but we certainly have room for improvement. many of the principles and methods outlined in this book would be excellent next steps, both at a university-wide level, as well as at an individual level for the faculty and staff of our fine institution. I plan to implement them in my own work with my classes and the programs with which I work. I recommend the book highly for any business, organization, or individual committed to providing better service to those with whom he or she interacts. A very good book on customer service, and how to provide better customer service. The philosophy in this book is based on how Disney trains all of their employees, and there is a lot of information on the Disney corporation, but there is also a lot of useful information here that can be applied by any business owner of any size business. The only difficulty I see is how to get your employees to buy into this philosophy. All I can say is that when you read this book you need to really appreciate the lengths that Walt went to to create the ultimate playland for kids. He used ideas and studied people to find out what works that no one had done before. All to create a place that was safe and secure. If you get nothing out of this book you're not trying. Tremendous book. It is great to read the behind the scenes view of one of the most amazing corporations in history. Nothing is done by chance. It had great tie ins to other corporations and how every industry can run with the same principles. One of the better self help business books that I have read. Definitely recommend if you need a good business book to read!! I loved this book and am using it at work as a guide in putting together a customer service initiative. The book outlines the approach Disney used to create it legendary customer service but does so in such a way to make it very adaptable for any organization. 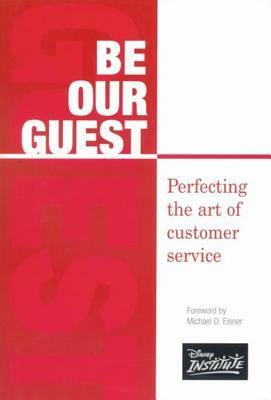 Excellent book on customer service! Clear, concise and adaptable to almost any organization. -it’s their special, individualized, and unscripted interactions with guests that create the most memorable Disney moments. -Quality Service means exceeding your guests’ expectations by paying attention to every detail of the delivery of your products and services. -There is a corporate-wide obsession to detail at Disney. Walt was famous for his eye for detail, and he made sure that everyone paid the same attention that he did. -At Disney, we try to create happiness for people of all ages everywhere. -For management, making guests happier than they expected to be is a guiding precept. -In Disney theme parks, “everything speaks” means that every detail—from the doorknobs to the dining rooms—sends a message to guests. -Deming, perhaps the most famous quality guru of all, pinpointed process as the primary determinant of product quality, and it plays just as large a role as cast or setting in the delivery of Quality Service. -“It might surprise you, but in our research, people cite interactions they have with our cast as the single biggest factor in their satisfaction and intent to return,” said Tom Staggs, who took on the role of Chairman of Walt Disney Parks and Resorts in January 2010, in an investor call in early 2011. -Talking about personal or job-related problems in front of our guests is unacceptable. -“There’s really no secret about our approach. We keep moving forward—opening new doors and doing new things—because we are curious. And curiosity keeps leading us down new paths. We’re always exploring and experimenting . . . we call it Imagineering—the blending of creative imagination and technical know-how. -Know your audience: Before creating a setting, obtain a firm understanding of who will be using it. Wear your guest’s shoes: That is, never forget the human factor. Evaluate your setting from the customer’s perspective by experiencing it as a customer. -Walt knew that the key to delivering Quality Service in a living movie meant designing defect-free processes and flawlessly repeating them. Inside are some shining examples of how Disney is the best in the industry at what they do. TWDC has sifted out the gold of what key successes make their parks run at peak efficiency and how to drive employees to perfection. A lot of this information would probably have been reviewed in a Disney employee's Traditions - so much of it, in fact, that I'm not sure this information is useful to anyone outside the Hospitality or Entertainment industries. But for those within those industries, this is Inside are some shining examples of how Disney is the best in the industry at what they do. TWDC has sifted out the gold of what key successes make their parks run at peak efficiency and how to drive employees to perfection. A lot of this information would probably have been reviewed in a Disney employee's Traditions - so much of it, in fact, that I'm not sure this information is useful to anyone outside the Hospitality or Entertainment industries. But for those within those industries, this is an excellent primer. Walt brought the attention to detail inherent in the animator's art to all of his company's ventures and that tradition carries through to the present day. It's been referred to as "bumping the lamp". Bumping the Lamp was born during the filming of Who Framed Roger Rabbit. In one scene, the movie's leading man bumps into a lamp hanging from the ceiling. The lamp swings back and forth and so does it's shadow. During the making of the film, the lamp and its shadow appeared in the live action setting the same way it would in the natural world. But what happened when the animated star Roger Rabbit was added to the scene? : That's right, the shadow never crossed our wise-cracking heroes face. Most of the film's viewers would have never noticed the difference and certainly the scene could have been shot without the lamp being bumped, but the film's animation artists made sure that the shading on Roger Rabbit accurately reflected the moving shadow cast by the live action lamp in each of the 24 frames in every second of the scene. They paid attention to the details and took that extra step in their commitment to a quality guest experience. John Hensch, one of the original Disney Imagineers, remembers watching Walt finesse a setting: "I was so astonished by the way Walt would create a sort of live action cross-dissolve when passing from one area of Disneyland to another. He would even insist on changing the texture of the pavement on the threshhold of each new land, because he said 'You can get information about a changing environment through the soles of your feet'". In Disney theme parks, "Everything Speaks" means that every detail, from the doorknobs to the dining rooms, sends a message to guests. That message must be consist with the common purpose and quality standards and it must support and further the show being created. "The average man won't really do a day's work unless he's caught and cannot get out of it" - Henry Ford's 1931 interview. He backed up this mean spirited declaration with the force of the Ford Service Department - a group of strong arming supervisors and security guards that intimidated and physically attacked company laborers who did not tow the company line. I got very little out of this book. That's probably because my business is online, and this book is a lot about interacting with customers in person, on your property. It had too much Disney history and not enough practical advice on emulating Disney's customer service in your business. It tells how Disney's service theme generates its service standards. It shows how those are delivered using three systems that are present in every organization: people, physical assets, processes. It also tells I got very little out of this book. That's probably because my business is online, and this book is a lot about interacting with customers in person, on your property. It had too much Disney history and not enough practical advice on emulating Disney's customer service in your business. It tells how Disney's service theme generates its service standards. It shows how those are delivered using three systems that are present in every organization: people, physical assets, processes. It also tells how those systems are integrated and aligned. It draws customer service lessons mostly from Disney's parks, and some from its movies. There are a few examples from Disney Institute clients, which are various organizations in various industries. I skimmed this, looking for ways to apply the lessons to my website maintenance company, OptimWise. Quality service means exceeding your guests' expectations and paying attention to detail. Don't just exceed expectations once in a while; make it a standard, daily practice. Treat every guest like a VIP. "Guests may not always be right, but they are always our guests." High-touch: Connect as humans. Give guests a chance to participate, make choices, interact with you. High-show: Build vivid presentations: colorful, memorable experiences. I’m very much a fan of books about the Disney Parks, so when I saw this book and it’s author being the Disney Parks, I thought wonders of what I’d find interesting. But it’s what I didn’t find much of in this book that stands out to me:Details of how their employees do it in specific cases that make sense. I mean there was lots of information, but they tried to tie these cases into how the reader can tie their concept into the readers businesses-not something I long for often. At first, it was an I’m very much a fan of books about the Disney Parks, so when I saw this book and it’s author being the Disney Parks, I thought wonders of what I’d find interesting. But it’s what I didn’t find much of in this book that stands out to me:Details of how their employees do it in specific cases that make sense. I mean there was lots of information, but they tried to tie these cases into how the reader can tie their concept into the readers businesses-not something I long for often. At first, it was an easy read. I took care of the first three chapters in the first few hours after the initial purchase, and the remainder on subsequent days. I found a few shareable concepts to Goodreads early on and that number decreased the later into the book I got. It was hard not finding any useful information to share in the last two chapters, but I guess it’s just got to be one in a million books that ends that way. I love everything about Disney, am fascinated with their operations and was excited to read this book. This book had lots of great snippets, but the writing was quite poor and lacking any sort of depth. The author only lightly skimmed the topics and often the sections ended abruptly, just when I thought I was really going to get some great information. The examples given of companies who’ve attended and used the Disney Institute were very poor and lacking any sort of depth. Much like the section I love everything about Disney, am fascinated with their operations and was excited to read this book. This book had lots of great snippets, but the writing was quite poor and lacking any sort of depth. The author only lightly skimmed the topics and often the sections ended abruptly, just when I thought I was really going to get some great information. Much like the sections of the book, the end came abruptly without any real conclusion. It almost seemed the author just got tired of writing and wanted to end it. The bad: although it's a solid book on dealing with customers straight from the Disney factory, sometimes it's lackluster. Sure, it's noticeable that there is a great customer culture at Disney and that many tools and techniques are used to maximise customer retention, satisfaction and more, but at the end of the day, I'm not sure how replicable most of these techniques are to other companies. At times, it feels more like the Disney story than a manual for other companies. The good: it's a very i The bad: although it's a solid book on dealing with customers straight from the Disney factory, sometimes it's lackluster. Sure, it's noticeable that there is a great customer culture at Disney and that many tools and techniques are used to maximise customer retention, satisfaction and more, but at the end of the day, I'm not sure how replicable most of these techniques are to other companies. At times, it feels more like the Disney story than a manual for other companies. I've gone to the full day seminar from Disney and this audiobook was basically a replay of the seminar I went to. They have some pretty good examples of basic customer service practices. Yet, Disney has taken customer service to a higher level. This is not only for the customer's benefit, but for Disney's financial benefit too. This is good information if you are looking for good customer service ideas. However, you need to be prepared to be bombarded with how "wonderful" Disney is and a nearly I've gone to the full day seminar from Disney and this audiobook was basically a replay of the seminar I went to. They have some pretty good examples of basic customer service practices. Yet, Disney has taken customer service to a higher level. This is not only for the customer's benefit, but for Disney's financial benefit too. There’s several really good quotes like “We don’t put people in Disney. We put Disney in people” and “Our front line is our bottom line.” There are also some good themes like “plussing” (to make better) and big ideas to follow for customer service, but overall the book fell flat for me because it was difficult to identify how to actually apply any of the concepts for business. Additionally, it was just boring. I didn’t really know a lot about Disney before reading this book. In fact, I was always a little perplexed as to why so many people I knew loved the Disney Parks so much. I found this book to see if I could learn why. This was a good decision. This book gave me the answer. It’s an inside look on the secrets of how to deliver customer service by one of the greatest American organizations today. The book is a little dry, but full of good info and plenty of examples. As with most business philosophy books, it is short on writing style, but offers a unique brand of business philosophy.I will keep some takeways. That being said, the entire time I was reading the book, the little devil on my shoulder kept whispering in my ear, "yes, that is all good and great, the happiest place on earth.... so they how is it that the little boy was recently gobbled up by a shark while staying at Disneyworld?" Walter Elias “Walt” Disney (December 5, 1901 – December 15, 1966) was an American film producer, director, screenwriter, voice actor, animator, entrepreneur, Note: The decision was made to consolidate all Disney publications under the name Walt Disney Company. This profile is for Walt Disney, the characters he created, and the company he founded. Any questions, please ask in the Librarian's Group.